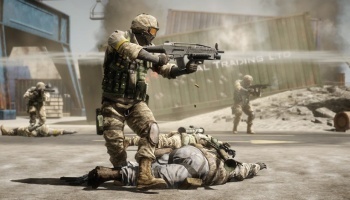 Battlefield: Bad Company 2 developer DICE has pledged that it will never charge money for downloadable map packs. Downloadable map packs in games are always going to be a tricky subject, because you run the risk of splitting your player base, especially when you charge money for them. It's good news for Bad Company 2 players however, as developer DICE has promised not to charge for maps for the game. "We don't ever want to charge for our maps and insisted to EA that this attitude was crucial when it came to keeping our community happy and playing together," said DICE senior producer Patrick Bach, adding, "We're owned by EA but we're still very much DICE." DICE has commented that it has 'generous' amounts of DLC in store for Bad Company 2, and while it's great that DICE wants to support the Bad Company 2 community, it's hard to see this as anything other than another salvo in the war against Modern Warfare 2. Still, there's no reason for BC2 players to care, as they will continue to get free stuff regardless of the motive behind it.